Stormize has the ability to use statistics from many advertising platforms. In order to add these statistics inside Stormize you need to link your accounts to Stormize. Let me take you through the steps to link a Facebook Ads account to Stormize. You must have an administrator access to do this. 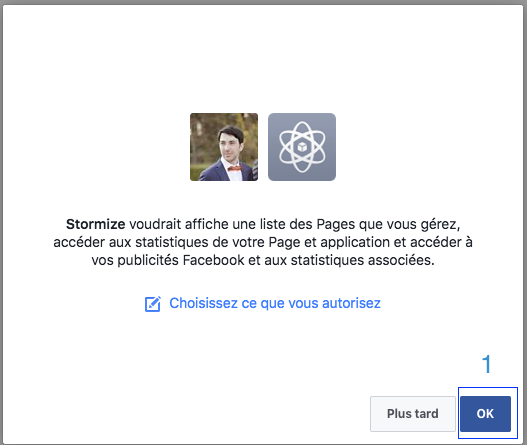 Once you've logged into Stormize, make sure to select the Stormize account you want to link to your Facebook Ads account (1). This page let you link multiple sort of partners to your Stormize account. Now we'll link your Facebook ads Account! Click Add Account (1) and select "Facebook Ads" (2). Now you've authorized Stormize to access your Facebook accounts, you must select the accounts to link. Stormize will automatically import stats from all linked accounts. In order do so simply select the accounts you want (1) and then save (2). Please note that you can select multiple accounts at one time.